Well as I sit here typing this, me and The Mrs are sat in the ultrasound department of the hospital, waiting for our appointment. I haven’t been able to convince her otherwise, so it looks like we are about to find out if its a boy or a girl that’s going to change our world again in December. Well everything seems fine, we have to go back in a week as the sonographer couldn’t see the heart valves properly and she also couldn’t check the palette, so she wants us to come back. 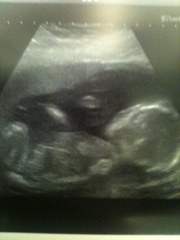 Would you believe, the the sonographer forgot to tell us if it was a boy it a girl!!! But The Mrs, couldnt wait and asked her…. Way to go. Congratulations to you both. Congratulations, boy number 2 means double trouble! For what it’s worth I’m in the camp of not finding out too, managed to persuade wifey it was the way forward, although she did almost break when we were having the scan!